I love my Young Living Essential Oils. Seriously, I’m a bit of a junkie. I’ve made a few DIY Essential Oil Necklaces over the past year using leather in lockets. 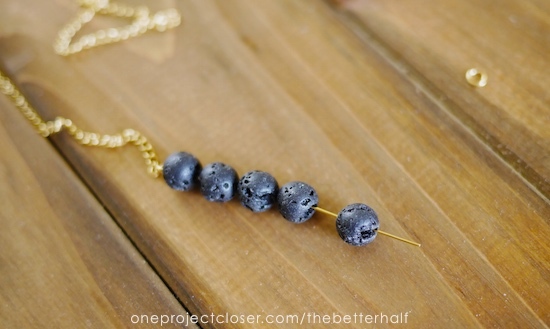 But recently, a friend of a friend, Erin heard that you can use lava beads to diffuse oils. I was a bit skeptical at first. But honestly, the lava beads worked even better than leather! All credit goes to Erin. I will forever be grateful for the diffusing jewelry possibilities that are now open to me! woot. Before I tell you how to make your own DIY Essential Oils Diffuser Necklace, I wanted to share with you my general awesomeness. haha No, seriously though, I don’t love getting my picture taken and am happiest behind the camera. But I am trying to model some self-love and confidence for my daughters. Soooooo…here I am, rocking my necklace last weekend before Ethan and I went on a date. Also note my fabulous new glasses that Firmoo.com sent me. 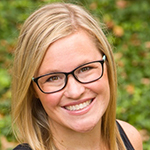 Maybe my favorite pair yet, but definitely contributing to my glasses addiction with their super cute and inexpensive glasses. haha And yes, I know my pants are amazing. Did you notice what is on them? Ten cool points to anyone who can say what they are! Thanks to my neighbor and friend, Amy with LulaRoe who gave them to me. I LOVE THEM! 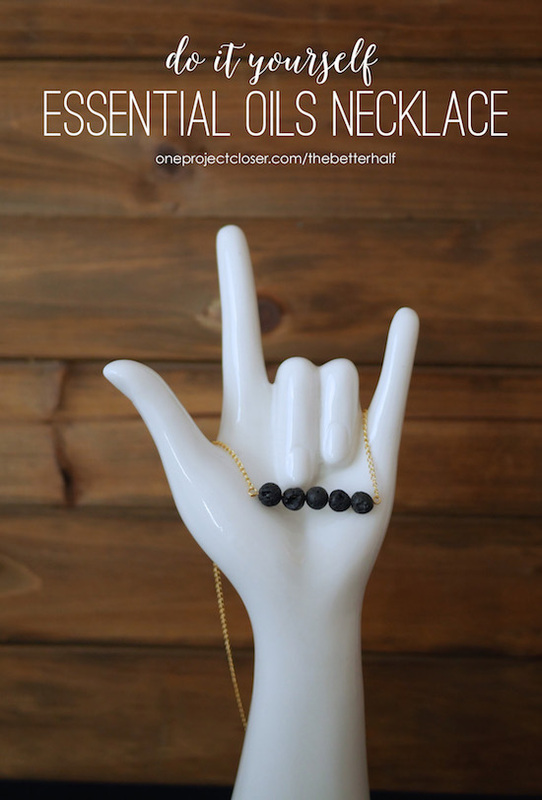 Tutorial for your DIY Diffuser Necklace! Enough rambling, let’s get to the fun stuff. 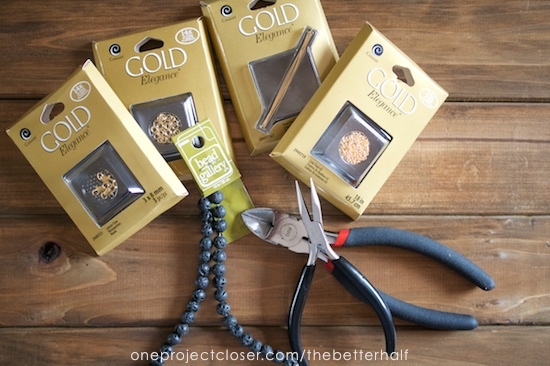 Generally, if you know the basics of jewelry making, this is super easy. I am, by no means, an expert. In fact, I would consider myself a DIY jewelry novice. But its lots of fun, and its okay to start over when you make a mistake (I know I do!). Note: I used gold-plated supplies so the necklace would last, especially since it will likely come into contact with the essential oils. But you can use any chain and material you wish. The concepts are the same. 1. Cut the head off the Headpin and use your needle nose jewelry pliers to create a small circle at the end. 2. Before closing the circle, loop one end of the chain on to the circle, then close it. 3. String five lava beads onto the head pin. 4. Cut off the excess headpin, to leave about a half-inch left. This step may not be necessary depending on the size of your headpin. 5. 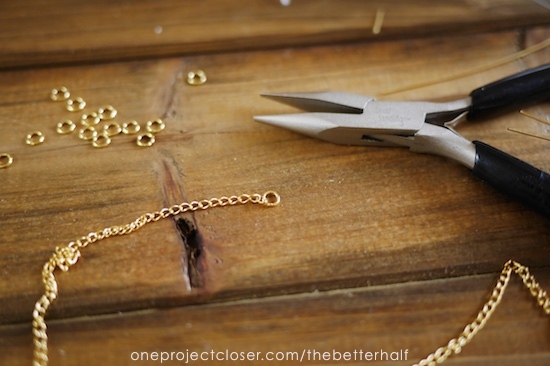 Use your needle nose jewelry pliers to create a small circle at the end. Again, before closing the circle, loop one end of the chain on to the circle, then close it. 6. Your chain is now looped without a closure. Find the halfway point and use wire cutters to cut one link. You should now have two equal chains off each end of the beaded headpin. 7. On one side of the chain, add a split ring or jump ring. On the other side of the chain, add a lobster claw. 8. Rub 1 – 2 drops of your favorite Young Living Essential Oils and wear with pride!! You did it! Now, for the money shots. Because seriously, the camera does not do this bad boy justice! A side note, two drops of Stress Away was almost too strong and lasted about three hours! That’s crazy because normally I find Stress Away to be not strong enough. woot. Interested in Young Living Essential Oils? Get started now using my referral link so I get credit for your purchase (THANK YOU! ), or learn more. What do you think? 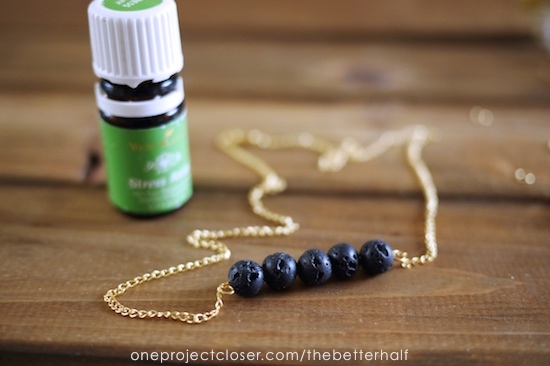 What oil will you be putting on your DIY Essential Oil Diffuser Necklace? 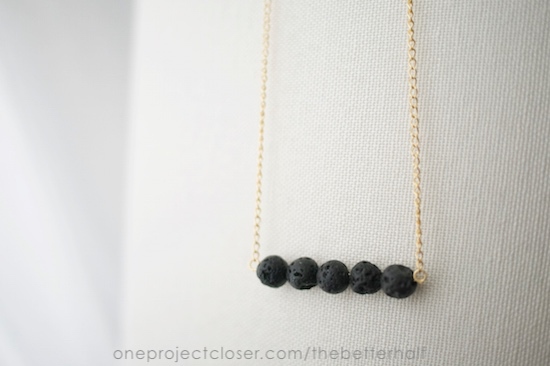 I love this idea, the necklace is super cute too! I’m going to have to make one of these for my SIL for her birthday! PS love the new glasses! Where do you get lava beads ? What a cool idea … I’m going to have to make one! I love your new glasses! They are so flattering on you! Love the necklace idea and those glasses are adorable! woot, thanks jenna! I love the glasses too! This is such a cool idea and your are so cute! 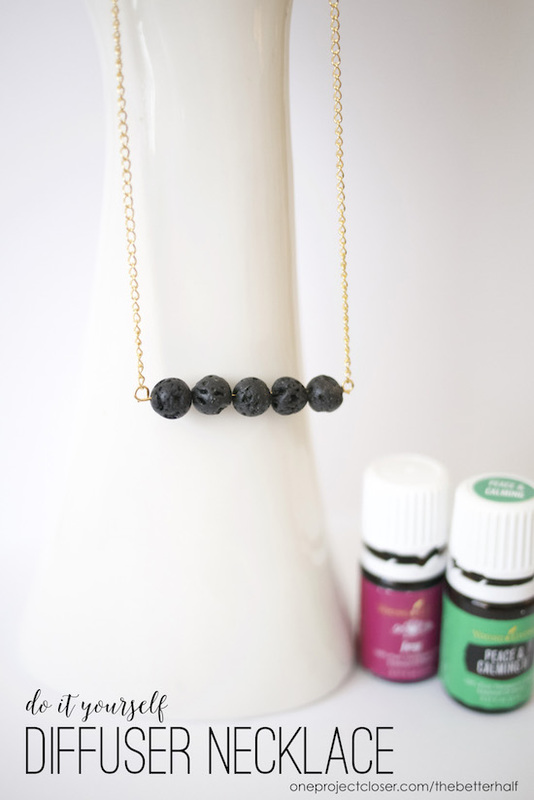 So if you wanted to use a different oil everyday, could you do that or do you need different necklaces for different oils? Does that make sense??? Can I ask where you got all of your supplies? How long does the essential oils last on the beads? My sister has been using lava bead bracelets for a while and raves about them. I found your tutorial and just finished making the necklace! I’m in love! Thank you for making it so easy! Ahh I’m so excited I found this! I was just looking at a necklace like this on Amazon but I love making things on my own. I didn’t realize how easy this necklace is. Thanks! What if your necklace is worn w/something higher in the neck, and the beads touch the clothing/fabric ~ does the oil get on, or possibly stain, your clothes? Those cute glasses make me want to toss my contacts for a spin with specs again!!! Hello there! This is such a cute idea! Would you mind if I asked where you purchased all of your supplies? 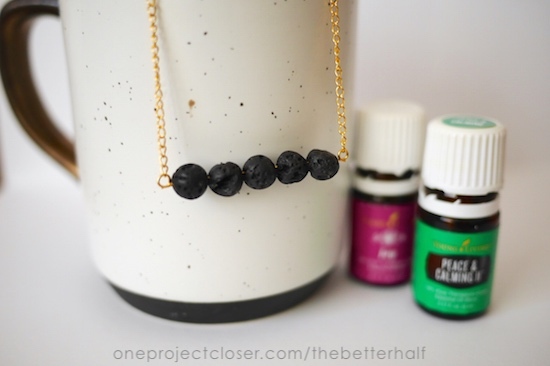 So, I’m new and want to know once you make the necklace/bracelet and put the oil on it, how long does it last and the person you gifted it to would need a bottle to reapply the oil? thanks! 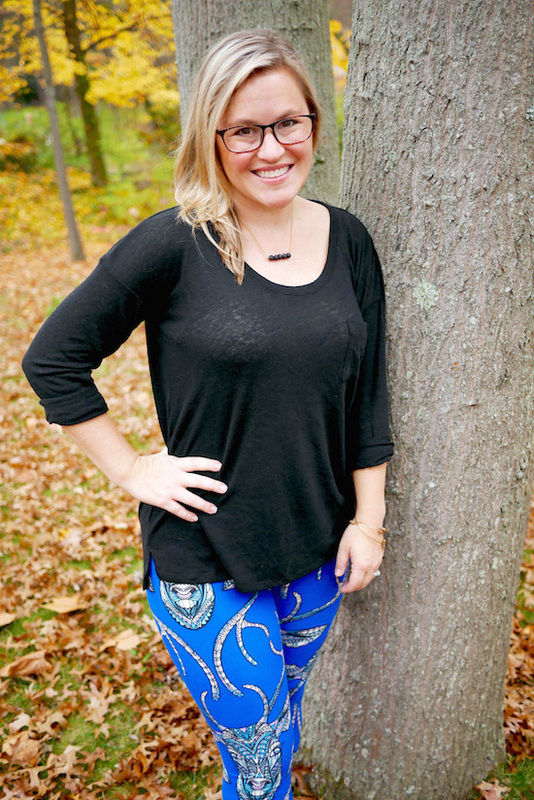 Love your whole picture and you’re rocking those pants! Hi! So I would love to make the necklace. I’m seeing head pins with gauge numbers. What number does yours say? My wife loves her Essential Oils! She always is diffusing them on her Essential Oil Necklace as an alternative to perfume, plus they are good for you! Such a great idea and so do-able, even for beginners. My only concern is whether the oils will stain clothing it touches. Thanks in advance for a reply!